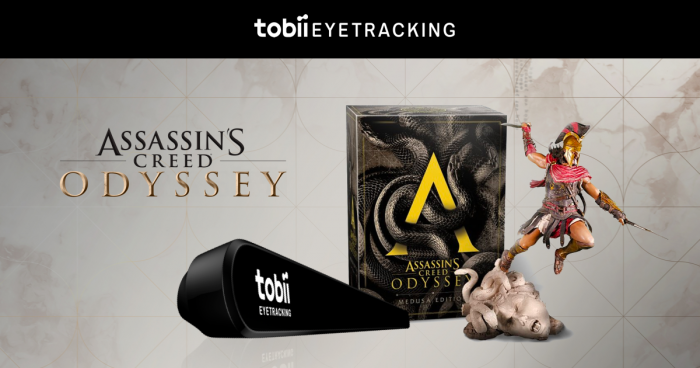 Tobii has teamed up with Ubisoft to gift one of their fans with brand new eye tracker! To enter in this Assassin’s Creed Odyssey Medusa Edition and Tobii Eye Tracker 4C Giveaway grab your free entries by following few simple steps listed down below! Get into the game and interact with your computer like never before. The Tobii Eye Tracker 4C is the only PC gaming peripheral with simultaneous eye and head tracking, allowing you to use your gaze as an additional input together with keyboard and mouse. When your eyes are in play, you engage your senses and use your instincts, immersing you in the gameplay experience and making your device smarter and more responsive to you. The Tobii Ghost software allows streamers and content creators to add an eye tracking overlay to their videos. Showing where you are looking on the screen gives your viewers more insights into your gameplay, provides more entertainment or simply adds another layer to give your content an edge.